Rhys Bowen: There were bread lines and wounded soldiers without much done for them. At the same time young aristocrats went to parties in their castles and on their yachts. It was as if they did not have a care in the world. Until World War II aristocratic women put on a long dress, a fur, and fancy shoes for dinner every night, while the men wore jackets and ties. People dressed as if they were going to Church. EC: Do you think the aristocratic class in the 1930s was in a period of transition? RB: I thought of writing a series with the most unlikely heroine, a royal who was penniless. I wanted the recurring theme to be how would she support herself and survive? Remember, servants had done everything for them. Since only the sons, mostly the first-born, received the inheritance what happened to girls like my main character Georgie. She was expected to marry someone of the same class so marriage became a business transaction. They all are trying to live the life they knew, but it is getting more difficult. Everything fell apart after World War II because no one could afford the up keep and the taxes. EC: Why did you have Georgie and Darcy elope? RB: In England if you want to marry you have to wait three weeks and must announce it in the Church. Since Greta Green in Scotland is on the border many couples went there to marry. There was also the problem of Georgie being in line for the British Crown and Darcy is Catholic. Since the 1700s if someone was in the line of succession they cannot marry a Catholic. This law existed until it was repealed last year. EC: Were the gangsters based on anyone? RB: I thought it would be fun to bring in a gangster story although I did change the names. I based it on the 1932 real heist of a gang that stole two million dollars with the cash never recovered. EC: Who was Dorcy based upon? RB: People might think he was based on Mr. Dorcy from Pride and Prejudice. However, the TV version has a famous scene of young Colin coming out of a lake after swimming with his black curls all wet. This is exactly how I pictured my Dorcy: black Irish with black hair and bright blue eyes. I want him to be roguish, dashing, charismatic, handsome, and full of energy. EC: Who was Georgie based upon? RB: She is based on a character from the Foyle’s War TV series. There was a young upper class girl who was tall, blond, and a little bit awkward. I could identify with her and Georgie because that is how I am, a bit clumsy during moments of stress. EC: What about your next book projects? 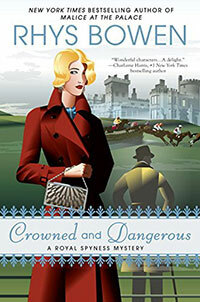 RB: The next Royal Spyness mystery has Georgie being asked to spy on Edward and Mrs. Simpson by the Queen while they all are in Italy. She was going to be there anyway because she was visiting her friend Belinda. But there is a conference going on between England, France, and Italy to discuss the growing Nazi threat, and Georgie gets tangled up in it. The next Molly Murphy will not come out until November 2017. It is called The Ghost Of Christmas Past and is about a child that disappeared years ago.